Today I found out why Dalmatians are commonly firehouse dogs. 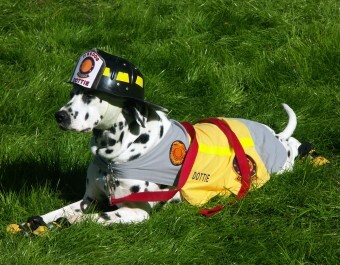 Dalmatians as firehouse dogs have become so common in books and movies that it’s practically a stereotype. It turns out that Dalmatians actually really do have a strong history in the firehouse, and they used to have some purpose, too. Before fire trucks, there were horse-drawn carriages. One of the most effective fire-fighting tools in the middle of the 18th century was the steam pumper- a machine that consisted of a boiler which was able to use steam to force water out of hoses and onto a fire. The fire brigade’s horse-drawn carriages would be loaded up with the machine, the horses would be hitched up, and the vehicle would tear off down the road. When fire fighters were racing off to fight the flames, they didn’t have time for the horses to spook nor to slow down for all the pedestrians using the road, which is where the Dalmatians came in. When the travellers rested for the night, the dogs were also useful for standing guard over the horses and the people’s belongings. English aristocrats soon picked up on the practice of having Dalmatians follow their carriages and the dogs even became something of a symbol of social status- the more Dalmatians that ran alongside your carriage, the wealthier you must be. Back to Dalmatians and the horse-drawn fire carriages- because of the dogs’ strong work ethic and stamina, they typically didn’t have any trouble keeping up with the carriages even when they were flying down the roads at high speeds. The Dalmatian would scare away anything that might spook the horses, and also just as importantly served as the first “siren.” Its bark would alert pedestrians on the road that the fire brigade was on its way, and to move off the street. The horses were also a bit leery of being so close to burning buildings when it came time to stop. (Can you blame them?) While the firemen unloaded their equipment and rushed off to put the fire out, their trusty Dalmatians would stay with the cart, keeping the horses calm and guarding the firemen’s belongings. Not only that, but once they were back at the fire house, the Dalmatian were often trained to sniff out and kill rats and other vermin—kind of like having a barking cat that was far less lazy than a meowing mouse-catcher. When the much more efficient motorized fire trucks were created, there were no longer horses for Dalmatians to keep company and no need for them to run ahead of the trucks to alert people that the fire brigade was coming—there were sirens for that now. Their usefulness spent, Dalmatians might have vanished from fire stations altogether. Instead, they turned into fire station mascots, particularly popular when firefighters go around teaching kids about fire safety. Of course, at this point any dog could be used, and sometimes that’s the case, but given the long standing tradition of using Dalmatians, it seems likely they will remain the dog of choice at many fire stations for the foreseeable future. A common myth is that Dalmatians are kept in fire houses because unlike other breeds, the loud sound of the siren won’t hurt their ears. While it is true that Dalmatians are predisposed to deafness (only about 70% have normal hearing), they were originally around to primarily function as a siren, as stated, so their hearing wasn’t really a factor. Blue-eyed Dalmatians have a higher risk of being deaf than brown-eyed Dalmatians. Studies to find out why have been inconclusive to date. Partially or fully deaf Dalmatians still make excellent pets as long as they have the appropriate training. The Dalmatian Heritage project started in 2005 and aims to “breed out” the various health defects that plague Dalmatians by only breeding dogs with normal hearing, normal urinary metabolism, and dogs who are friendly and confident. In Britain, Dalmatians are sometimes called “English coach dogs” or “plum pudding dogs”. Careers other than “fire dog” that Dalmatians are somewhat well suited for include search and rescue, running partner, and guardian. The exact origin of the Dalmatian is unknown, though it’s likely that the breed originated in the Croatian region “Dalmatia” for which it is named. It’s estimated that they’ve been around for 600 years or more, but the name Dalmatian wasn’t used in the 1780s. Dalmatians gained great popularity in Britain before they spread once again to Europe and, eventually, the Americas. As you can probably imagine, the popularity of the breed exploded with the release of The Hundred and One Dalmatians book by Dodie Smith in 1956 and the Disney animated film in 1961. This wasn’t necessarily a good thing. Kind of like buying kids a rabbit or baby chick at Easter, parents rushed out to get Dalmatian puppies for their children without researching the breed first to find out if they were right for their family. Aside from needing extra training if the dog has some deafness, Dalmatians are a high-energy breed who prefer running along after fire carriages than sitting with a child as it watches TV. Many of the dogs were dumped at pounds when they were found to be incompatible with certain families’ lifestyles, and as a result Dalmatian rescues were quickly set up to try to find them new homes. Great info! The Dalmatian spots could be seen from a great distance. When folks in town saw a Dalmatian running, they knew to get out of the way that a fire carriage was coming. The first steam fire engine was not invented until 1829 and was not in common use for structure fires until about 1860. This was the 19th Century not the 18th. The 18th century was 1700 to 1799. Many people are confused by the terminology. The 1st Century was year 0 to 99, the 2nd was 100-199 etc.